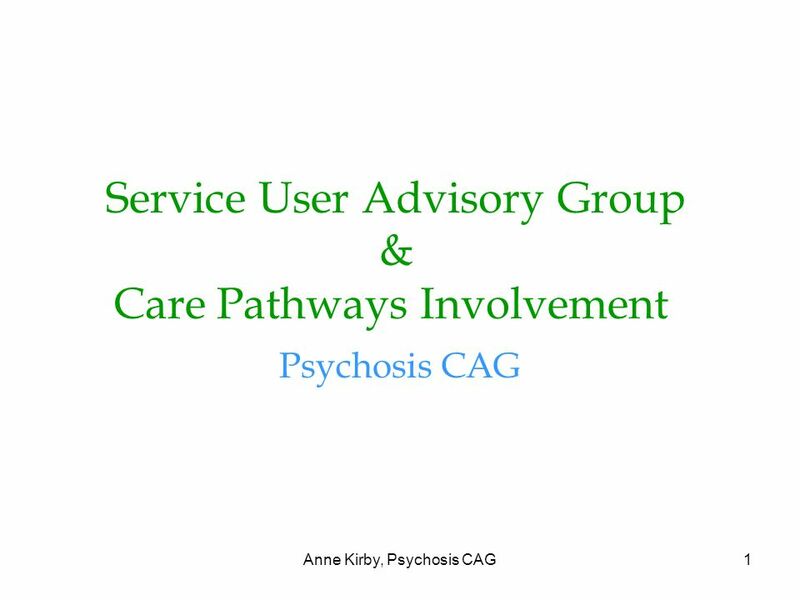 Anne Kirby, Psychosis CAG1 Service User Advisory Group & Care Pathways Involvement Psychosis CAG. 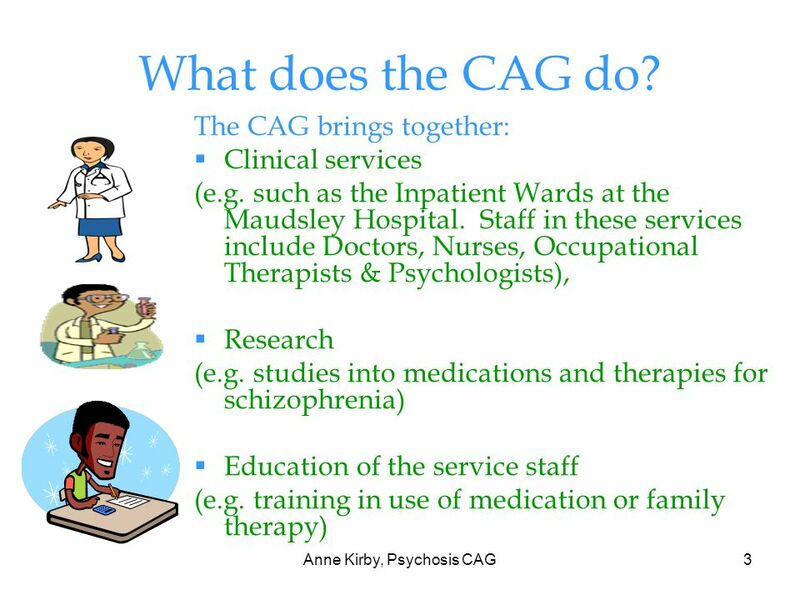 2 Anne Kirby, Psychosis CAG2 What is the Psychosis Clinical Academic Group (CAG)? 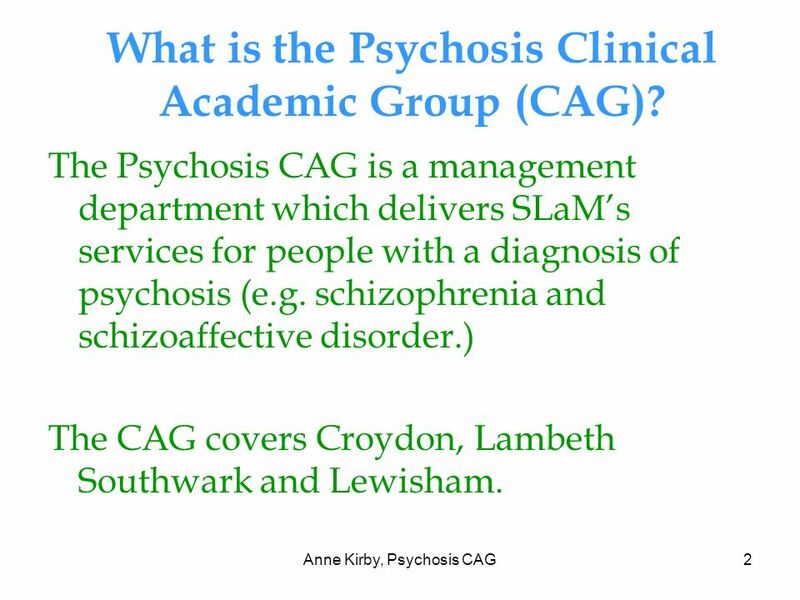 The Psychosis CAG is a management department which delivers SLaMs services for people with a diagnosis of psychosis (e.g. schizophrenia and schizoaffective disorder.) The CAG covers Croydon, Lambeth Southwark and Lewisham. 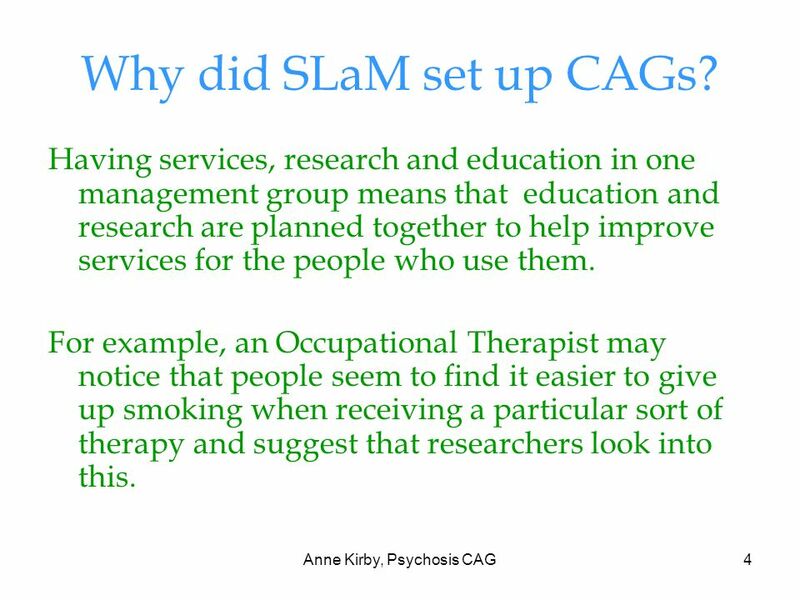 4 Anne Kirby, Psychosis CAG4 Why did SLaM set up CAGs? Having services, research and education in one management group means that education and research are planned together to help improve services for the people who use them. For example, an Occupational Therapist may notice that people seem to find it easier to give up smoking when receiving a particular sort of therapy and suggest that researchers look into this. 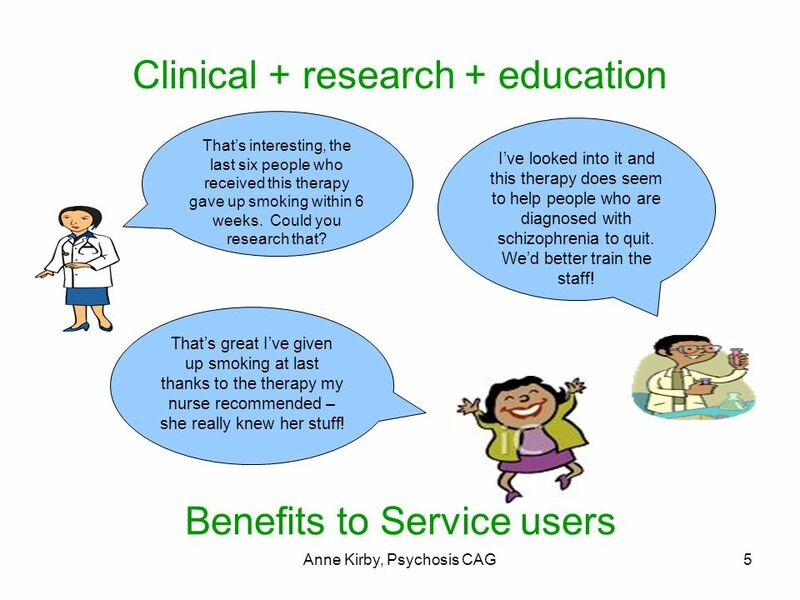 Download ppt "Anne Kirby, Psychosis CAG1 Service User Advisory Group & Care Pathways Involvement Psychosis CAG." Spirituality and Mental Health Spirituality Research Programme At Birmingham and Solihull Mental Health NHS Foundation Trust Madeleine Parkes. Ψ CDA PSYCHOLOGY UNIT Ψ RECOGNIZES WORLD MENTAL HEALTH DAY 2014! Relieving distress, transforming lives Data Collection in IAPT The Importance of collecting data in IAPT-compliant services (References: The IAPT Data. The Role of Service User Co-facilitators in Delivering ACT for Recovery Workshops Dr Emma O’Donoghue – Senior Clinical Psychologist / Study Co-ordinator. Pathways 4 Life Presentation by: Davina Lytton, Kelly Davis & Michelle Ebanks. Medical Staff. Hospital Outpatient Department Inpatient Department Doctor´s office Waiting room Examination room Operating theatre Sisters´room Reception. Involving acute hospital inpatients in the evaluation of an occupational therapy service Cathy Robertson Senior occupational therapist Wirral Hospital. JSNA Schizophrenia progress report Martina Pickin Locum Consultant in Public Health. St John’s Community Hospital Administration of IV Antibiotics Administration of Intravenous Antibiotics in St. John’s Community Hospital Melissa Kelly. Nebraska Early Development Network (EDN) or Iowa Early Access EDN and Early Access provide early intervention services that: Supports children birth to. What clinicians are saying about you... “All said, a well-rounded (student) therapist and will make a wonderful coworker in the future.” “She has. Assertive Community Treatment (ACT) NAMI Maryland Annual Conference The Conference Center at Sheppard Pratt Friday, October 17, 2014 Saturday, October. Did staff listen? Are they easy to talk to? 60% of young people found staff certainly listened to them, and 30% found this to be partly true. Young people.